One year after a devastating earthquake, Haitians continue to endure appalling living conditions amid a nationwide cholera outbreak, despite the largest humanitarian aid deployment in the world. On my recent visit to Haiti, the devastation caused by the earthquake that hit one year ago in January was still very visible. I was shocked by the magnitude of the catastrophe and at the same time very impressed with the extraordinary resilience demonstrated by the Haitian people. This has been the largest emergency response in the 40-year history of Médecins Sans Frontières/Doctors Without Borders (MSF). We have been stretched to the limits by the urgency and extent of medical needs in the immediate aftermath of the quake and beyond. But the work done by the MSF teams has been outstanding. Thanks to the generosity of MSF donors worldwide, we were able to quickly react to the medical and humanitarian needs of Haitians following the earthquake and, more recently, during the fast-moving cholera outbreak that has now killed more than 3,000 people. One year after the catastrophe, it’s important to look back on what has been done and achieved and to review the choices that were made. We must also be ready to tackle remaining challenges, formulate necessary strategies, and learn lessons that will improve our emergency responses in the future. International agencies must live up to the commitments they have made to the Haitian people and to their donors. As humanitarian actors, we have to be accountable for our operational choices and transparent about our expenditures. 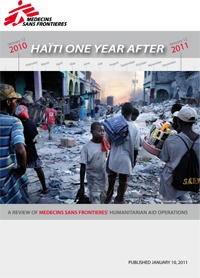 MSF has documented its experience in Haiti last year in a critical way, and I invite you to read this report. More than one million people remain homeless in Haiti today. Even before the earthquake, hundreds of thousands of Haitians lived in precarious conditions, particularly in the capital’s historically marginalized slums, where few aid organizations are providing assistance. Their immediate needs must remain at the forefront of the humanitarian action in Haiti. Lastly, I would like to thank the more than 8,000 MSF personnel who have worked tirelessly to respond to the needs of the Haitian people. We are also grateful to the Haitian people for welcoming us and supporting our actions. And, one year on, we remember and miss the MSF staff, patients and family members who lost their lives in the earthquake. 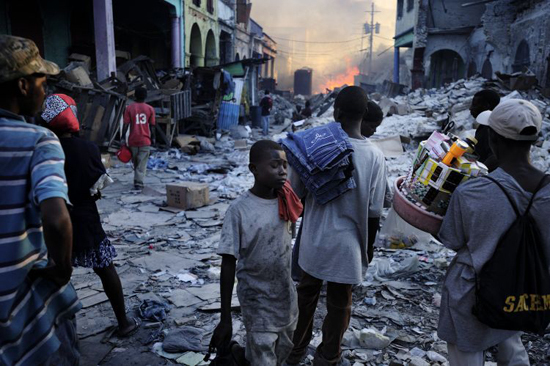 Haitians faced the adversities of life on a daily basis even before a devastating earthquake struck on January 12, 2010. The first few days, operating theaters have been set up under plastic sheeting and in shipping containers to stand up to the emergency in Port-au-Prince. Cesarean sections, amputations or wound disinfections—each day, MSF teams performed an average of 50 operations. Such a situation was unheard of. Thousands upon thousands of people lived in shanty-filled slums that were regularly rendered all but inaccessible by mud flows that followed heavy rains. Economic opportunities were few, unemployment was widespread, and residents were well accustomed to spasms of organized violence and political upheaval. It was due to the striking lack of access to health care and the intermittent outbreaks of violence that MSF had come to work in the country in the first place, nearly 20 years ago. For most Haitians, even basic health care was out of reach, as fees charged by the public and private health facilities made them unaffordable. Public hospitals and clinics were often plagued by management problems and strikes, or shortages of staff, drugs, and medical supplies. Patients could be turned away because the hospitals were full, or they would have to abandon treatment when they ran out of money. Giving birth was itself a risk; Haiti’s maternal mortality rate was 630 deaths per 100,000, the highest in the hemisphere, and 50 times the rate in the United States next door. In Port-au-Prince, many of the poor were highly dependent on MSF’s free emergency services. As a major medical and humanitarian organization that’s been present in Haiti since 1991, MSF saw firsthand how Haiti’s people are exposed to life-threatening suffering and neglect even when violence was muted. The country could hardly have been less well-placed to deal with the huge additional demands that a natural catastrophe would place on its medical resources. 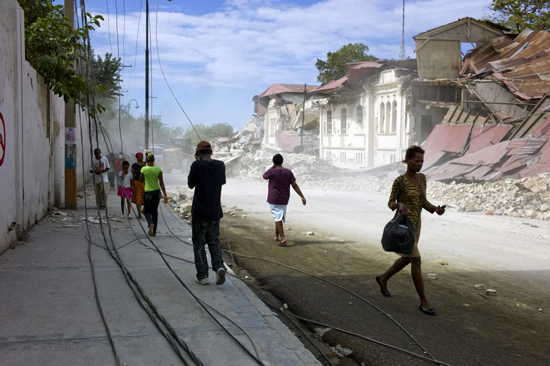 It was against this backdrop that the January 12 earthquake hit with more than enough power to throw Haiti into a period of turmoil that went beyond anything even its most beleaguered residents had known. The first few hours right after the earthquake, hundreds of injured overwhelmed the care centers. Serious injuries, broken limbs, gynecological and obstetric care, psychological care... In two days, the staff already on site treated about 1,000 people despite the loss of many MSF members and the destruction of several buildings where the NGO was working. The toll was staggering. Hundreds of thousands lay dead and injured. Millions were suddenly homeless. The headquarters of Haiti’s few functioning institutions were strewn with debris and rendered nearly inoperable. The organizations that would ostensibly coordinate a disaster response—the Haitian government, the United Nations—were themselves badly hit as well. There was, therefore, no staging ground for the response and no one present in Haiti who could provide any real coordination of the massive amounts of emergency aid entering the country. At the time of the earthquake, MSF, which had been operating three hospitals in Port-au-Prince, responded as quickly and comprehensively as possible to the medical and humanitarian needs of the victims of the disaster. Thousands of Haitians, most of whom were themselves directly affected by the disaster, mobilized along with hundreds of international staff to help MSF provide assistance. MSF’s regular deployment of 800 field staff in Port-au-Prince quickly expanded to 3,400 people working in 26 hospitals and 4 mobile clinics. Within weeks, hundreds of thousands of individuals around the world generously donated to MSF. Donors would eventually pledge more than €104 million ($138 million), making possible the largest emergency operation ever undertaken by MSF. The near complete destruction of an already inadequate health sector and the unfulfilled commitments of the humanitarian relief system to meet some non-medical needs of the affected population would ultimately shape MSF’s response to the disaster in the days, weeks, and months that followed. This report intends to share with the general public, the people of Haiti, and our supporters a breakdown of how the funds donated to MSF for the earthquake emergency relief effort have been used to meet the needs of the Haitian people in the year since the earthquake hit. It attempts to outline the choices made by MSF in deploying its operations, the challenges we faced, the lessons we learned, and our plans and perspectives for the future. The report is broken into three sections. The figures below indicate the various activities undertaken by MSF in the 10 months after the earthquake struck Haiti. The second column accounts for the entire scope of activities carried out by MSF from January 12 through October 31, the latest date for which cumulative figures are available (aside from the number of patients treated for cholera, which stood at 91,000 on January 2, 2011).